Régime des Fleurs is the new niche line of filmmaker Alia Raza and stylist Ezra Woods. They debut with six fragrances in three 'tiers': the Lyrics (Water/Wood, Nitesurf and Turquoise), the Ballads (Bel Époq and Dove Grey) and the Epic (Nymphaea Caerulea). Régime des Fleurs has drawn inspiration from the cultivated opulence of 18th century Europe, the pathos and restraint of 20th century high-modernism, and the visceral sensations invoked by real life flora. Using an exceptionally high percentage of the most exquisite natural ingredients sourced from around the world and state of the art aroma materials on the cutting edge of science, Régime des Fleurs has created fragrances with unique touches of the uncanny and curious, resulting in scents that are at once insightful and addictive. Water/Wood ~ "A brisk wood. On a tranquil forest walk /A cool bracing mist/ Meets ancient sun-warmed trees." The notes include pale herbs, palo santo, pine needles, myrrh, rosewood, driftwood, cedarwood, sandalwood oil, tobacco, orris, white lotus and crystallized amber. Nitesurf (shown above right) ~ " A neon marine floral. The hot dry Santa Ana winds / Carry the scent of blossoming citrus groves / Across the valley to the light of the full moon / Fractured on crashing waves / of Venice beach." Featuring neroli, floralozone, phosphorescent petal accord, ginger lily, citrus, nautilus shell destructive distillation and ambergris. Turquoise (shown above left) ~ "A pastel nectar. The young dauphine Marie Antoinette / On an exuberant springtime tour / Across the kaleidoscopic pastures of India / Exotic garlands around her neck." The notes include rosebud dew, wild grass, turmeric, hedione, champaca, benzoin, fruit, cassie flower and beeswax. Bel Époq ~ "A cold jungle floral. The dangerously lush tropical imagery in the paintings of Paul Gaugin and Henri Rousseau. The foreboding portrayal of feminine sexuality in 19th century Gothic literature. Cold gardenias impatiently waiting in a florist's refrigerator." Notes include jungle herbs, stephanotis, tiare, honeysuckle, jasmine, green Ceylon powder, fuschia, creme d'ambergris and musk. Dove Grey ~ "A satin steel orris. Gian Lorenzo Bernini's white marble Bust of Medusa. Julia Hetta's portraits of Deeda Blair in her Manhattan apartment. The aldehydic air of an early 20th century metropolis." With metallic aldehydes, orris, white pepper, tarragon, tuberose, lavender, violet, Earl Grey vapor, willow, musk and petrichor. Nymphaea Caerulea ~ "A singing iridescent floral. An out of body experience, Nymphaea Caerulea dances on the skin with an extremely rare hyper-purified extraction of the sacred blue waterlily. Like the enchanting call of Sirens to chosen wayward ships, the mesmerizing base of Nymphaea Caerulea features an abundance of genuine White Ambergris, supported by celestial notes and shimmering accords composed of 80 ingredients: both precious naturals and intuitively selected aroma materials." The notes include blue lotus, ambergris, aurora reconstitution, Nile waterlily headspace, pandanus amaryllifolius, salty water, floral notes. Régime des Fleurs Lyrics Water/Wood, Nitesurf and Turquoise are $95 each for 30 ml Eau de Parfum. 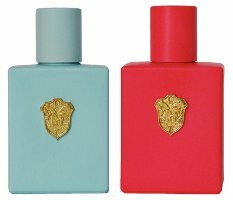 Ballads Bel Époq and Dove Grey are $225 each for 50 ml Eau de Parfum. Epic Nymphaea Caerulea is $350 for 8 ml Extrait de Parfum. All can be pre-ordered now at Luckyscent. I’ve heard the orris one is quite nice, and I must smell all orris/iris scents. Nice that they’re available in 30ml sizes. I don’t think I’ll be getting my nose on that extrait at that price though. I’ll admit I’m curious about the line. I heard good things about the iris on twitter too…looking forward to trying it. I have smelled them all. Every single one is unique and fulfills the oft overlooked requirement that perfume must, above all, smell good. Furthermore, the perfume descriptions, as tongue-in-cheek as they are, are somehow accurate–the comparison of Nitesurf with a highlighter, for example, is exactly right. Smell them, people. A company with as much humor and talent as Regime deserves the attention it has been getting. And, 30ml! A bit pricey, but it is the smaller size we always are asking for! I agree with the above comments on the increasing ridiculousness of the names of their notes and accords. I also dislike completely opaque bottles. Even so, i guess the most important thing is what they smell like. I think they are clear glass on one side, if that helps.